In 1892, George Cogswell bought the land where the Cushman Market and Café is now located. 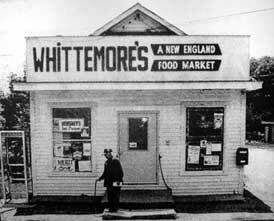 He built a grocery store on the site and the building has remained a market of one kind or another ever since. In those days, the area surrounding the store was a busy, industrial spot known as the City of North Amherst. The store has changed hands a number of times since the days of Cogswells, and the former commercial center has become residential; it is now known as Cushman Village. The last commercial vestige of this historic district is the Cushman Market and Café. In fact, the store nearly faced mandatory re-zoning to residential, after it had been closed for two years in 2003. That is the time when current owners, Pete Sylvan and Rebecca Schwartz, purchased the property just in time to avoid the re-zoning. In its latest incarnation, it now features a 36-seat café serving the finest food in the friendliest manner in North Amherst. There is also a small but well stocked market, featuring an excellent wine and beer selection, many local products as well as an eclectic mix of gifts and consumable treats.